Fixed income attribution is by its very nature a complex and mathematically demanding topic, and there is little information available on this area. Fixed Income Attribution has been written to fill this tremendous void. This comprehensive resource contains both theoretical and practical information about running and understanding fixed income attribution, including the mathematics of attribution, practical limitations, benchmarks, presentation tools, and choosing and running an attribution system. 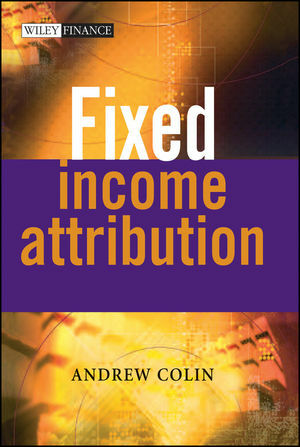 Filled with insightful examples and expert advice, Fixed Income Attribution is the perfect source of information for those working in this complex environment. ANDREW COLIN is Fixed Income Research Director for the StatPro Group plc. He has previously worked or consulted for Citibank London, Zurich Investment Management, the Commonwealth Bank, Suncorp Metway, Chubb Security, Arthur Andersen, EDS, Alcatel and the Royal Australian Navy. Andrew is Adjunct Professor in the Faculty of Business at Queensland University of Technology, Brisbane, and holds a PhD in Mathematics from the University of St Andrews. His research interests include risk management and machine intelligence.